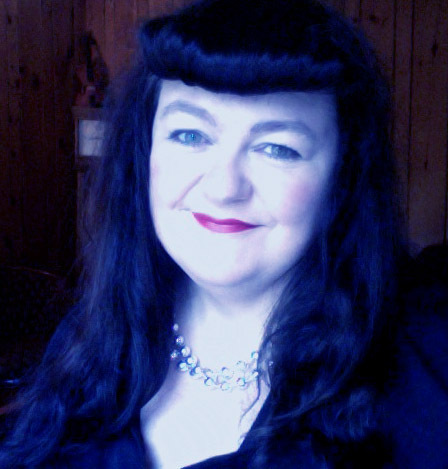 So waiting here for Tropical Storm Irene to share its winds and rain with us here in Nova Scotia, I decided it was about time to TRY a 1940s’s hairstyle, just for the fun of it, and take a photo… I haven’t really tried anything like this yet. For one thing I am self conscious of my fat face and I do lose my self confidence at times. There are always so many things I really want to do but talk my way out of them.. It was rather fun in the end …. I’ve been worrying about fellow human beings along the eastern seaboard of the US as Hurricane Irene begins to make landfall… imagining what it must be like to be evacuated from your home and not knowing what you would be faced with on your return. And then I thought of the families during the London Blitz of WWII, hunkering down in air raid shelters for several hours, not knowing if their homes would be destroyed…and this went on for years. Us brits have always faced adversity, throughout our history with a “Keep Calm and Carry On” attitude. The honest, hardworking people, roll their sleeves up, help their neighbours and “get on with it”… OH not forgetting the obligatory and necessary “hot, strong cuppa tea”… the British elixir. This morning, compelled to read the various news reports on Google and tracking the path of Hurricane Irene, I found myself a little depressed about it all, imagining how if the hurricane does cause damage to infrastructure, it could cause significant hardship, especially for the old and ill…. I reached for the two weeks ration of eggs I had saved up (just 2 eggs) and I made myself a decadent breakfast of scrambled eggs (with fresh chives and butter) on toast and topped with a little grated cheese…. It did indeed have me in raptures for the 5 1/2 minutes it took to consume. 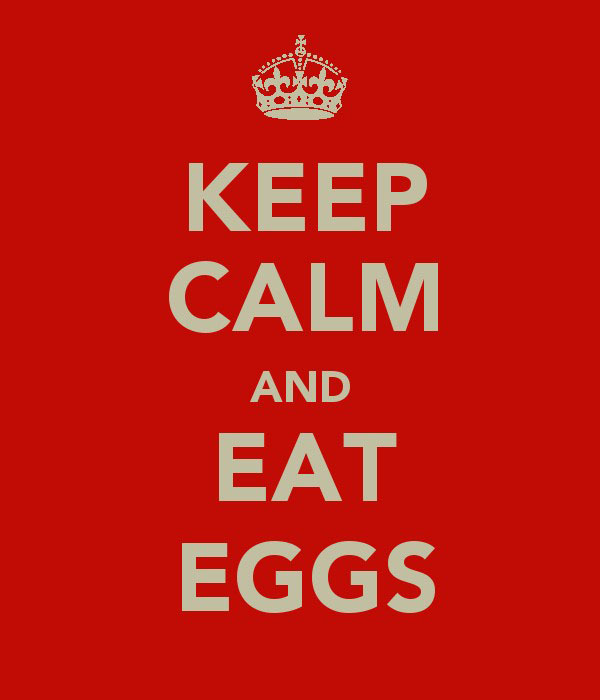 And then I felt extremely grateful that today, all I had to really worry about was eggs…. 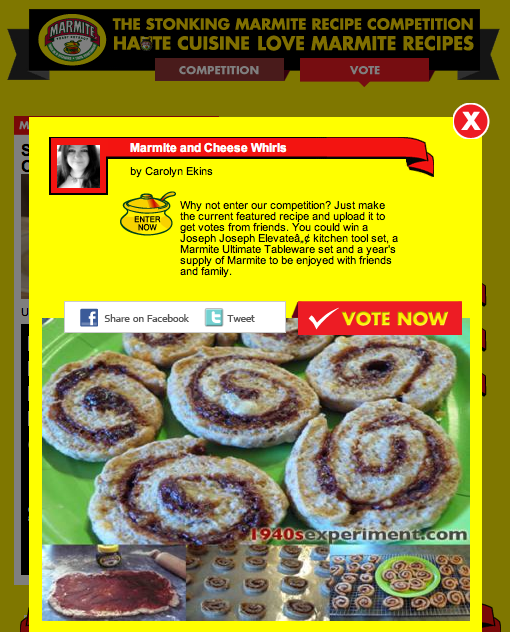 Marmite- My blog recipe won a prize in a national contest! This has been a good week…. not only do I now weigh 299 lb (OK I am sensing some quizzical looks but trust me this is a very positive thing getting below 300 lbs- yay!) BUT yesterday I had an e-mail from MARMITE CENTRAL…. Oh yes, I really did… when I saw the word “congratulations” I needed picking off the floor. For those of you who have never heard of Marmite let me tell you something…. it is ABSOLUTELY the food of the gods for British people … it has achieved cult status. 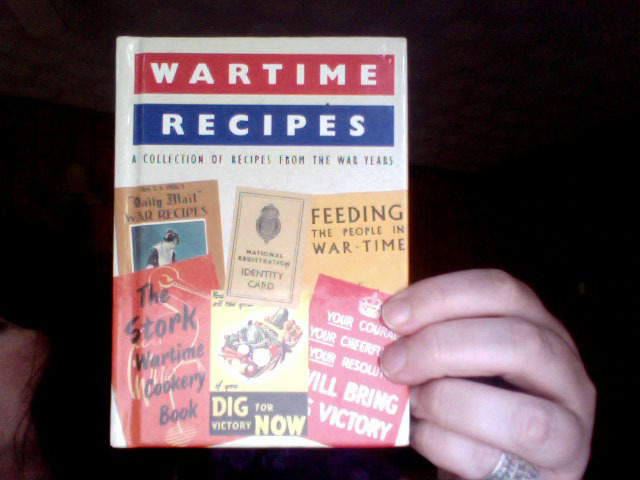 The reason I needed picking off the floor on seeing the word congratulations, was that one of my 1940s recipes was a runner up in a “National Marmite Facebook Contest”…. And here is the recipe that won our family so much Marmite I will promise to do plenty more 1940s recipes with it! Once I get to 199 lbs I’ll do it… I may just be able to get away with it then if I find a corset industrial enough. If I did it now, people would have to wring their knickers out (and not in a good way), following uncontrollable guffawing seeing an obese version of Betty Paige’s mother gesticulating before them…. the imagery is not good.. 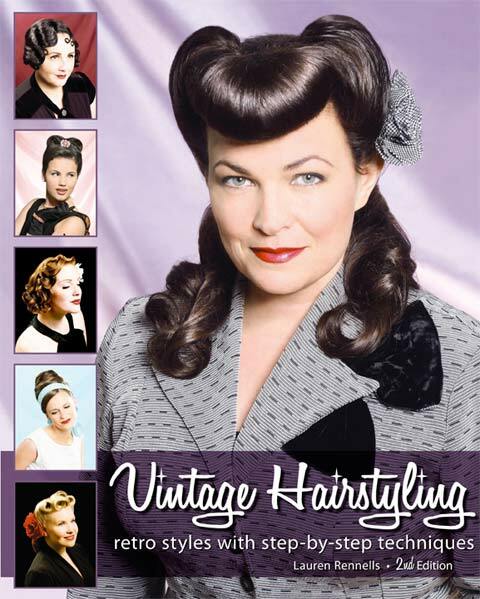 But OH- I do so want to cosplay 1940s… I really, really do…. At my size it would be safer, and more becoming, to perhaps wear something a little more homely….. I am thinking initially a wrap around 1940s style pinny, some sensible heels, some loosely curled and pinned hair and a BBC voice to pretend I am a young Marguerite Patten, instructing the masses on how to create nourishing food from their ration book allowances..
It’s nice to escape into a fantasy world once in a while. Strangely mine is austerity and cabbage….. I am still working hard to fulfill my promise to everyone and that is to re-create, photograph and share 100 authentic wartime recipes with you.. So far the count is nearing 50… NEARLY half way there! 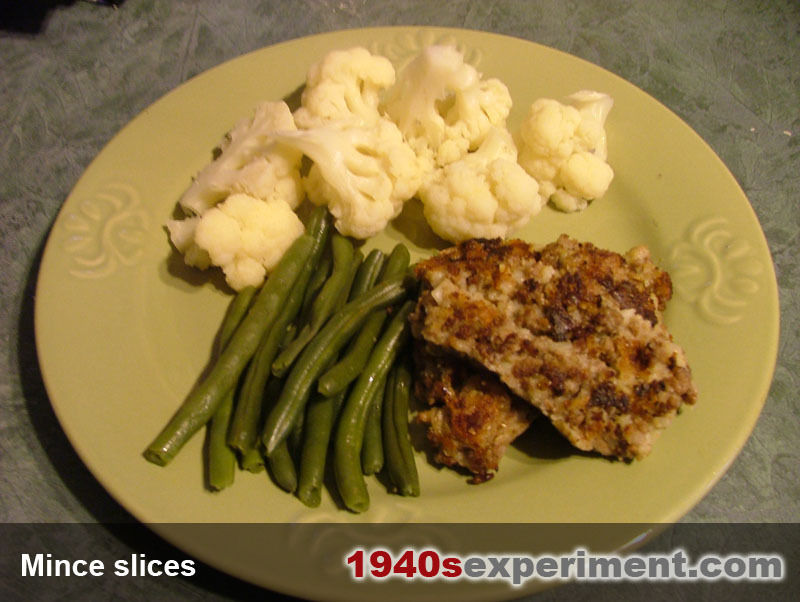 I love re-creating historical recipes… I guess my biggest wish would be able to stage the photos so they all were presented on authentic 1940s crockery and set in a 1940s kitchen…. how amazing would that be! Please take a moment to check all my recipes out… it’s truly amazing to step back in time and share the food our ancestors ate..
An absolutely hectic week and weekend! Let me start by saying that eventually, when I jumped on the scales Monday morning, I was down another 3 lbs (that makes 10 lbs in 3 weeks) and I am now exactly 300 lbs (bleh but less bleh than the blehs I’ve been feeling the least few weeks!). I am definitely on a roll, I am taking a proper course of natural multi-vitamins too and they are making me feel great! 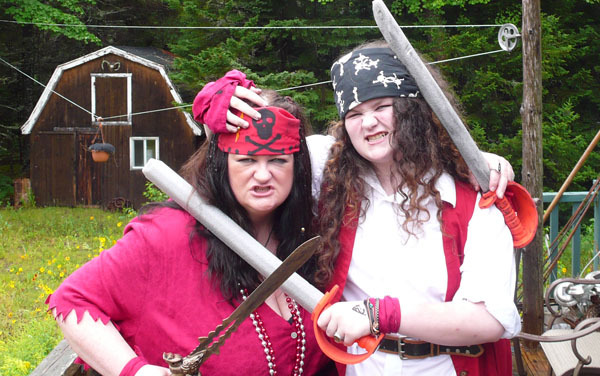 Despite having car trouble and not making it to the Mahone Bay Pirate Festival until 5 pm (and consequently missing all the festivities), Em Hobbit and I did have fun putting together Pirate outfits out of secondhand clothing, dollar store trinkets and some imagination. 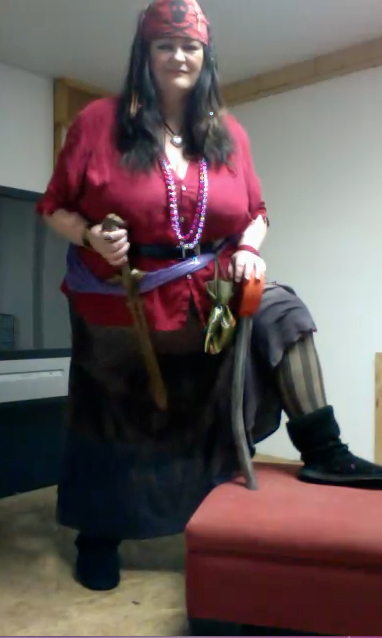 Going out in a skirt and indeed dressing as a Pirate and walking around like that in public made me feel a little nervous initially (even though I am pretty laid back and fairly outgoing, when you are big you always worry about your wobbly bits!) but actually in the end boosted my self confidence. It seems people don’t care what size you are as a Pirate- everyone wants to talk to you! The entertainer on the microphone, in the buskers tent shouted out “ARRRRRR, I see some more lovely wenches”, when Em and I walked by…. I know it’s all banter but it made me feel like I wasn’t such a blob after all!!!! 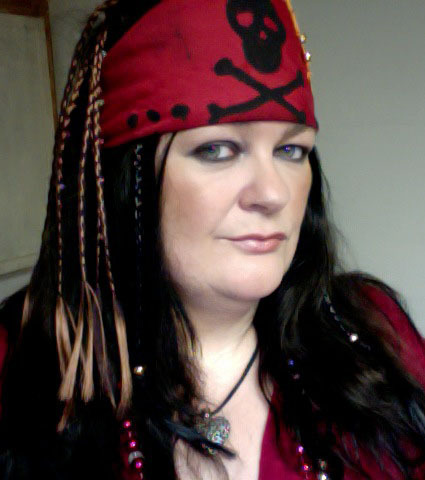 The very next day I wore my homemade Pirate outfit again. This time I manned the Visitors Centre during the tours of Nova Scotia’s very own treasure Island…. Oak Island itself! I am a founding director, along with some other great volunteers for the Friends of Oak Island Society and I love being involved with the history and the mystery of this place, even though finding time to help out as much as I’d really like, can be difficult working full time and with three Hobbits at home. 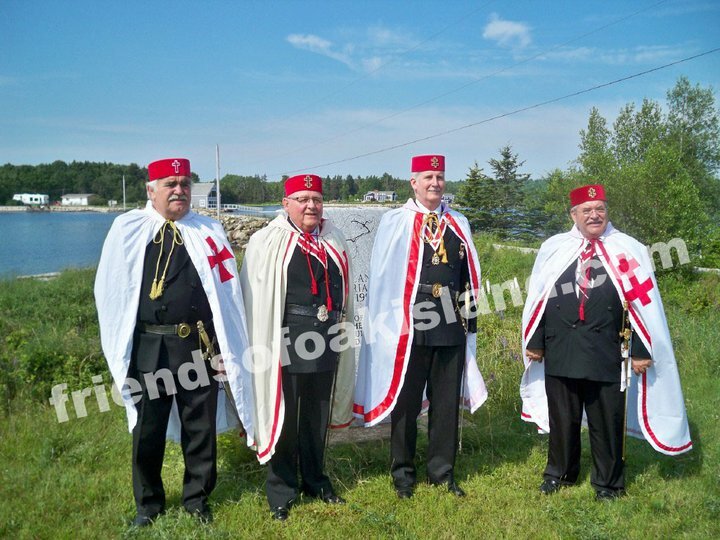 Recently we had a private tour for Freemasons, Knights Templar and DeMolay. It was the largest contingent of Freemasons ever to be on the island and it was a joy to see many wearing their regalia….exciting times! There is an interesting article in my employers newspaper this week! Feeling so positive, despite some very sad circumstances in our lives at the moment, really makes me want to strive to keep going, keep losing the weight, only put good food in my mouth and the 1940s ration diet is an excellent way of avoiding a diet full of salt & chemical laden processed foods. And now I have the taste for dressing up- watch this space! 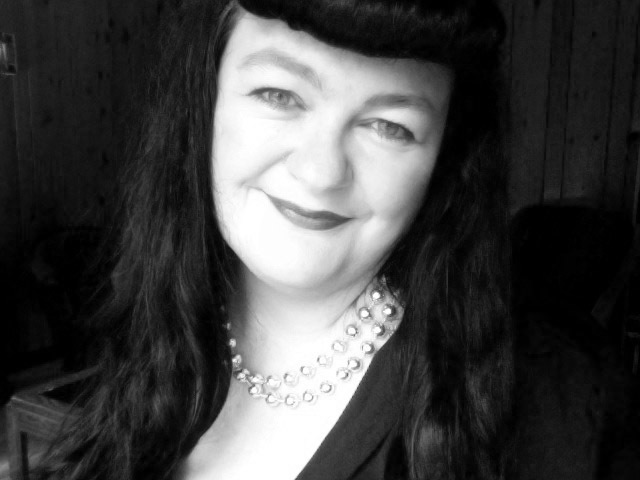 I think I may experiment with some 1940s clothes, put on my best BBC voice and do some recipes for YouTube…. what a LARF that would be!!!!! !